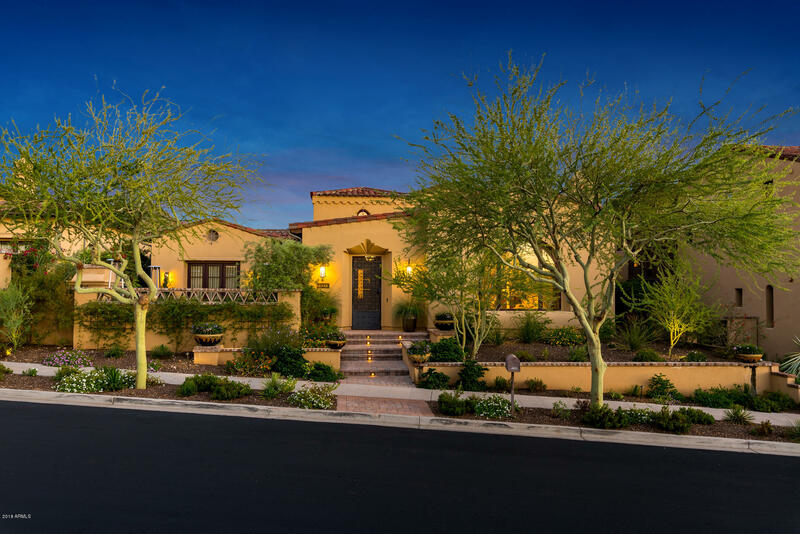 All Silverleaf homes currently listed for sale in Scottsdale as of 04/25/2019 are shown below. You can change the search criteria at any time by pressing the 'Change Search' button below. "Brand New near complete. 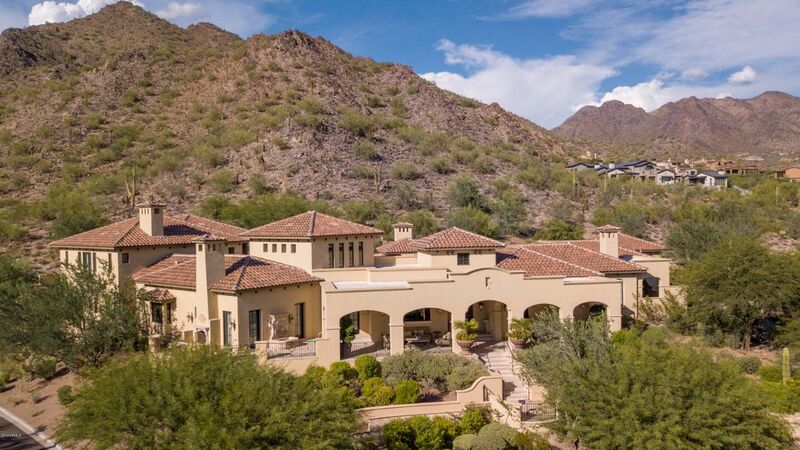 This 7,700/sf home showcases breathtaking city light & mountain views. Total of 5 Bedrooms, 2 offices 5 full & 2 half baths all decked out with the latest and finest finishes. The main level includes foyer, gourmet kitchen and dining opening to a covered patio. The Great room w/fireplace opens to the kitchen and dining area and has its own covered patio. 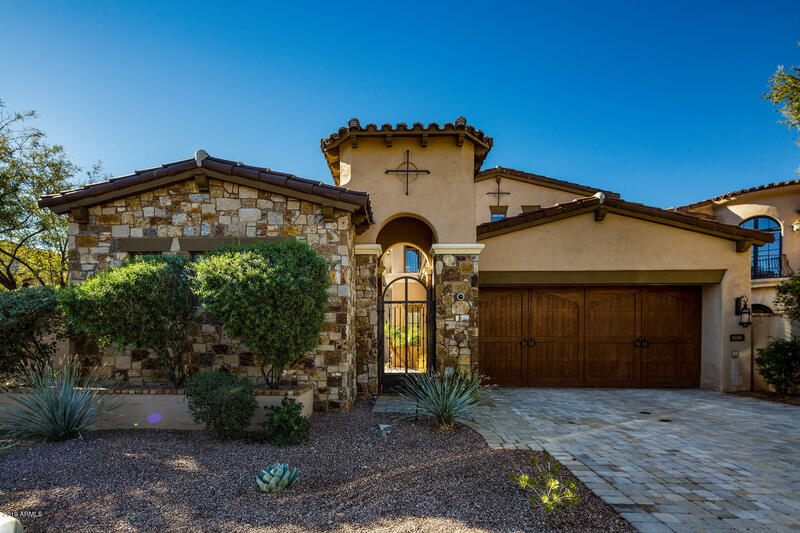 Also on the main level is the master suite w/fireplace and covered patio, 2 room guest casita, a game room and his and"
"The perfect combination of a private sanctuary & timeless architecture in the prestigious Silverleaf Club gated community. 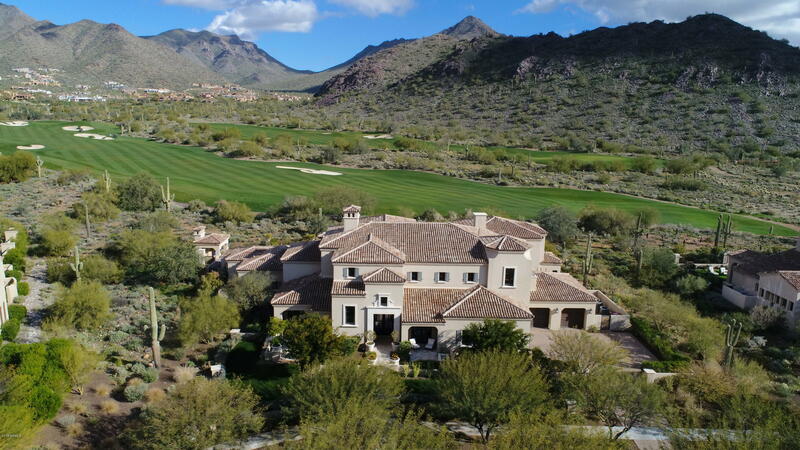 Meticulously designed on the lush desert mountain with impeccable views, is a pristine one of a kind estate with guest house. The stunning oasis spanning through the backyard rivals the most exquisite resort. Award winning designer, Caroline DeCesare uniquely suits a warm and welcoming interior to match her clubhouse design, filling each room with beautiful designer pieces r"
"Stunning Silverleaf Estate boasts unobstructed picturesque views of the McDowell Mountains and backs to the 3rd hole of the Silverleaf Golf Course. 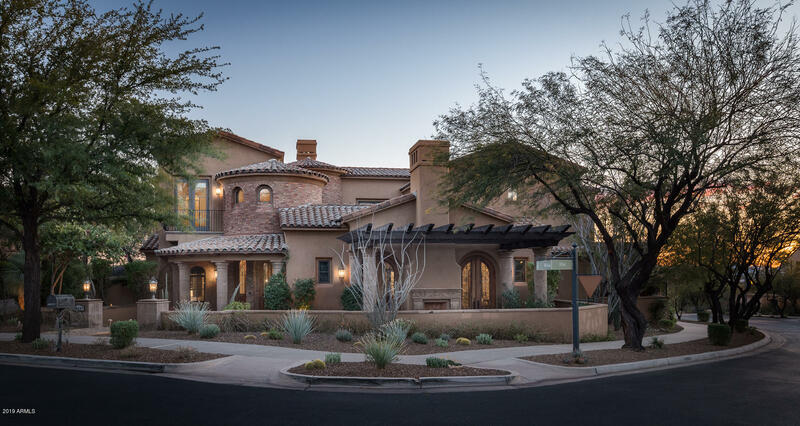 Distinctive home design by architect, Erik Peterson, of Phoenix Architecture, and builder, Steve Sommer, focused on deliberate detail to maximize functionality, livability, and views. Spacious great room with a grand limestone fireplace and double-island eat-in kitchen is the heart of the first level with the master retreat, breakfast bar, exercise"
"French Country romance welcomes you to this never before listed home in the exclusive Horseshoe Canyon community in Silverleaf. Interior courtyard with fireplace and access to the private guest casita. Warm interior with master bedroom and office on main floor, three ensuite bedrooms and game room upstairs with multiple outdoor viewing spaces to enjoy the mountains and sunsets. Gourmet kitchen with double islands and breakfast nook. Large laundry room with extra office space and tons of storage." "Celebrate the good life in this spectacular custom sanctuary boasting city light views, exceptional sunsets and pristine mountain vistas in every direction. 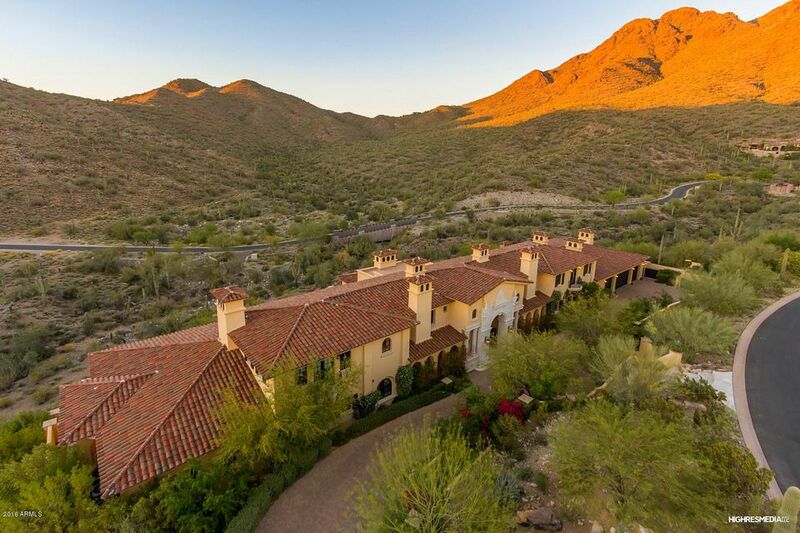 Privacy is the cornerstone of this home, tucked away on 2 generous acres backing to the preserve in the Upper Canyon, in the prestigious community of Silverleaf. This single story, split floor-plan house is the 'right size' at just under 5700 square feet. 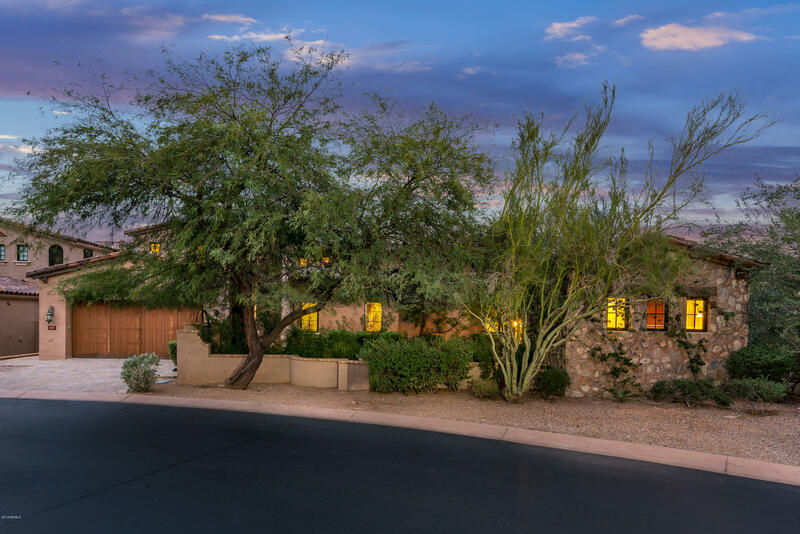 It is light and bright and captures the very essence of desert living with generous ind"
"Elegance abounds in this pristine Silverleaf, Horseshoe Canyon residence located in walking distance to the Silverleaf Club and Silverleaf Parks. The masterful design embodies luxury finishes throughout this 5 bedroom, 7 bath sophisticated retreat with intimate entertaining and living spaces that flow to the outdoor living patios and outdoor kitchen, past the pool and spa, and lead to a detached guest house. 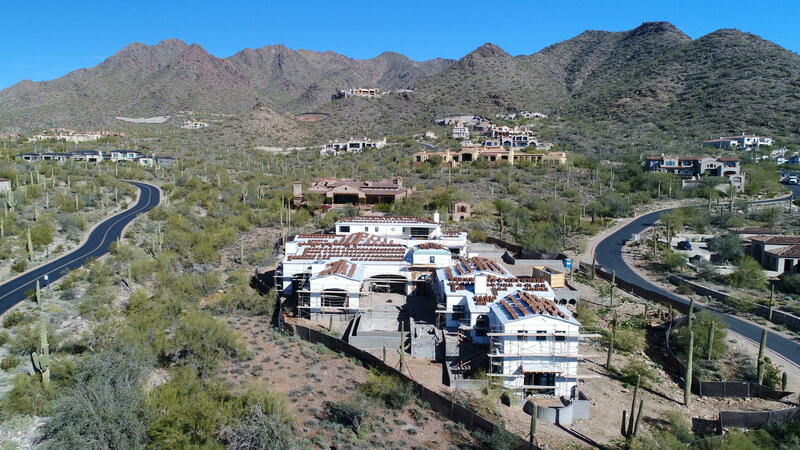 Other special highlights include customized exercise room with views, 1000 bottle walk-i"
"Horseshoe Canyon in Silverleaf is one of the most sought after addresses in the valley, and this 5, 044 sq. ft. Spanish Colonial is breathtaking. Situated on a lush 1/2 acre lot with multiple interior and outdoor courtyards, this fabulously appointed home is in impeccable condition and includes the highest quality finishes including Venetian plaster, Canterra surrounds, wood beam ceilings, built in wetbar, full Crestron, chef's kitchen AND an elevator. Pocket doors from the great room lead you o"
"Exquisite Camelot Verandah nestled adjacent to a natural preserve in the sought after neighborhood of Horseshoe Canyon in Silverleaf. Access to this impeccably designed and decorated home is through a charming courtyard that includes a water feature and outdoor fireplace. With an Open Space floorplan and impeccable attention to detail, this home is immaculate in every way including the highest quality finishes throughout, vaulted ceilings, beautiful hardwood flooring, media room, 800 bottle "
"Highly upgraded custom Verandah home in The Parks of Silverleaf. Large, private corner lot facing a park, adjacent to a wash, with mountain views. Gourmet kitchen with two islands, alder cabinets, Viking appliances, stone backsplash and granite counters opens to family room with a gorgeous dual-sided fireplace. Large office or game room space available just off the family room and opens to the pool and patio. Separate kitchen nook. Master Suite includes separate sitting room, wood flooring throu"
"Elegance in Arcadia at Silverleaf! Mediterranean Brilliance embraces this home. Bold Canterra Stone, sleek, beautiful marble, fine crystal & sterling silver finishes are an integral part of it's inviting charm. Gorgeous mountain views to enjoy from the private master balcony & expansive resort backyard. Pool is graced by regal lion fountains. Relax in the spa, or by the glowing fire-pit. Practice putting on your own green while a delicious meal is on the BBQ. The elegant media room is soundproof"
"Move-in Ready February 2019 to this beautifully appointed residence at ICON Silverleaf, a new collection of luxury single level flats representing the only residential offering of its kind in the exclusive community of Silverleaf at DC Ranch. These residences are served by semi-private elevators and have expansive views of the mountains and city and offer fine finishes including 30'' Sub Zero SS wine ref. @ butlers pantry, built-in Wolf steam oven, Madre Pearl Quartzite waterfall edge counters w"
"Estimated March/April move in for this home! 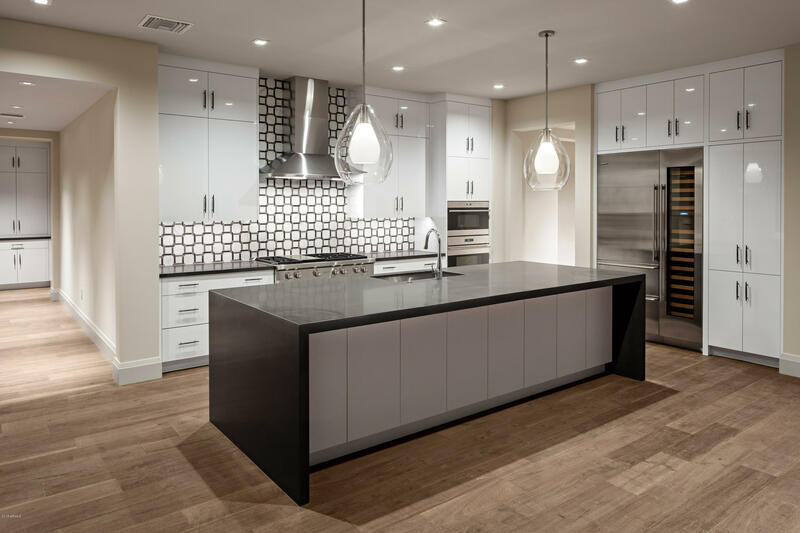 Exciting new steel and concrete constructed flats with outstanding finishes including, Pearl Grey wood floors, limestone at guest bath, Walker Zanger stone floors at master bath. Sub Zero Ref./Freezer/Wine combo, ''Taj Royale'' Ceaserstone island w/ waterfall edge, modern slab rift cut oak custom cabinets and Crestron Smart Home. 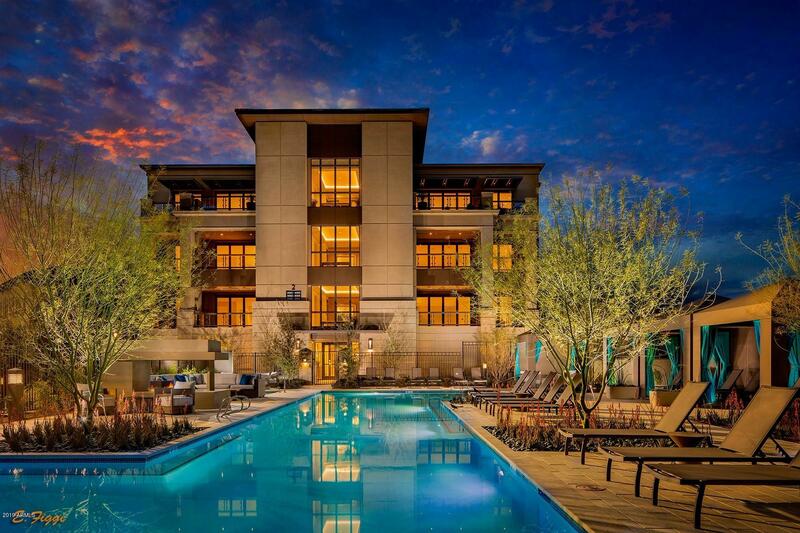 A new collection of 72 luxury single-story condos within Silverleaf at DC Ranch. 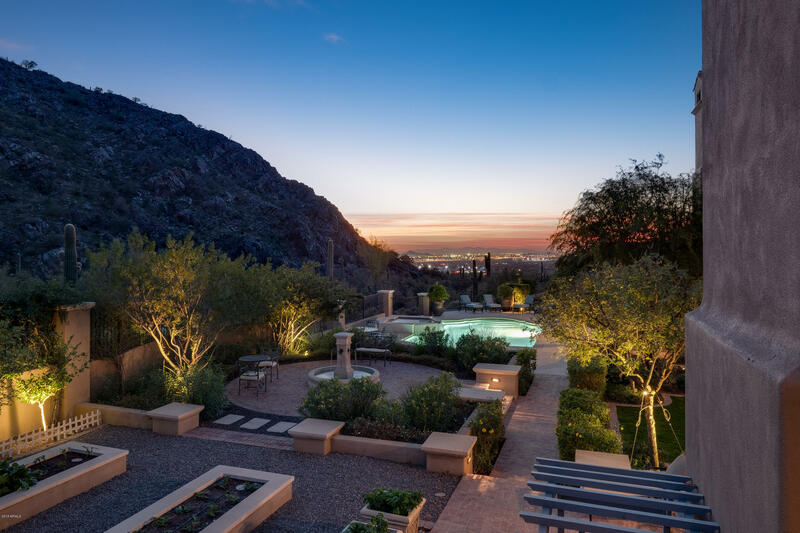 ICON represents the only residential off"
"Location, Location, Location......highly desirable Horseshoe Canyon in the exclusive North Scottsdale community of Silverleaf. Accommodating all lifestyles whether it be year round or lock and leave, this Canyon Villa, designed and built by world renowned architect Bing Hu, offers a main level with master bedroom, gorgeous office with custom builtins, separate guest casita and gorgeous outdoor living including a large heated spool, putting green, fire pit and gorgeous Arizona sunsets. 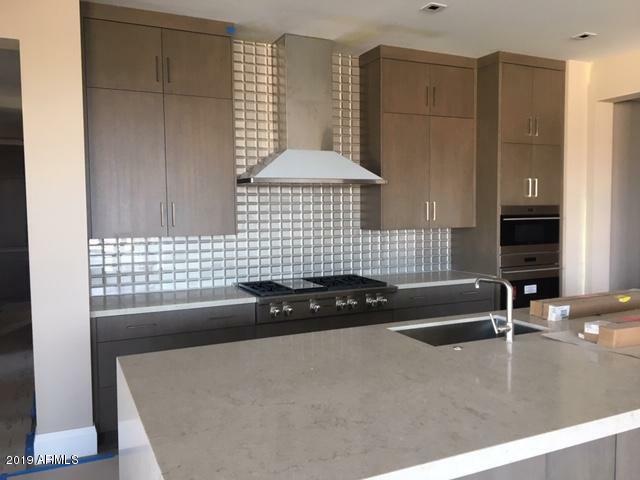 Second lev"
"MOVE IN READY -February 2019 - ICON Silverleaf features spacious flats with expansive views and semi-private elevators and is a rare opp. 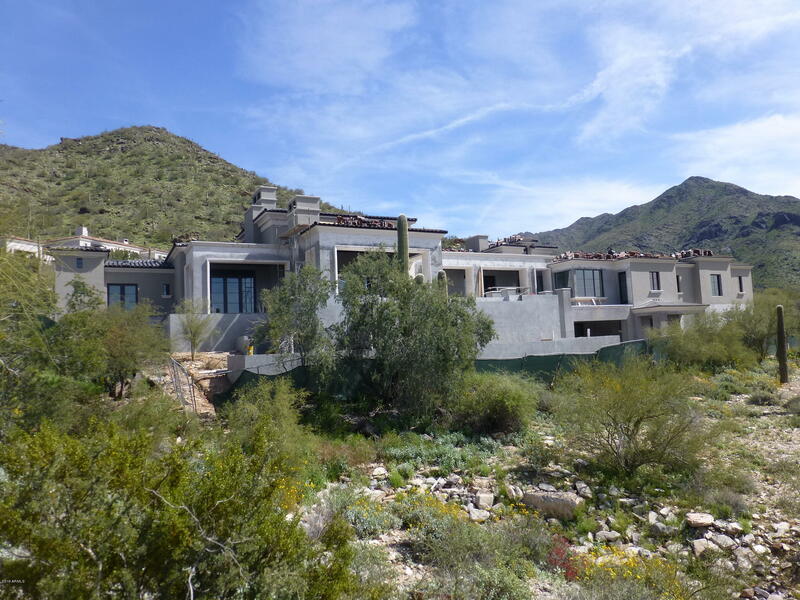 for new steel and concrete construction with luxury lock and leave lifestyle in Silverleaf at DC Ranch. 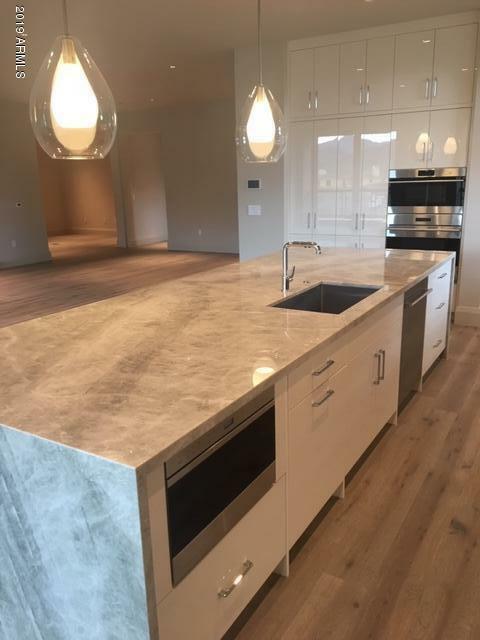 This residence is 2,757 Sq Ft 2 bed, plus den, 2.5 baths, private deck, with finishes including wood floors, quartz waterfall countertops, custom cabinetry, Subzero Ref./Freezer/Wine Fridge combo., Walker Zanger marble tile work, walk in food pantry and cu"
"MOVE IN READY -APRIL 2019 Introducing ICON Silverleaf, all new steel and concrete construction with an opportunity for luxury lock and leave in Silverleaf at DC Ranch. Spacious flats incl. expansive views, large private decks and semi-private elevators. This residence is 2,722 Sq Ft , 2 Bedrooms plus den, 2.5 Baths , elegant finishes including wood floors throughout, entertainers kitchen w/ Sub Zero 30' Ref./Freezer plus 18'' Wine Ref., ''Wild Rice' quartz counter tops w/ waterfall edge and sle"
"Happy New Years and a Happy New Price. Seller has moved to new home in Silverleaf and is ready to sell!! 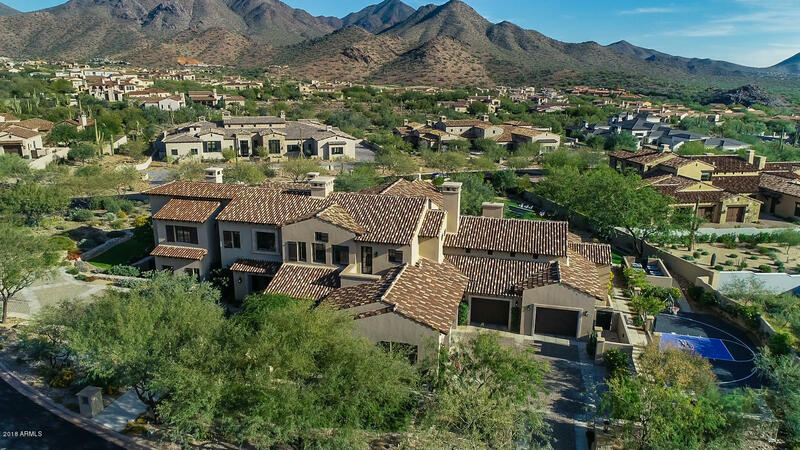 Welcome home to Paradise on the Parks in Silverleaf. 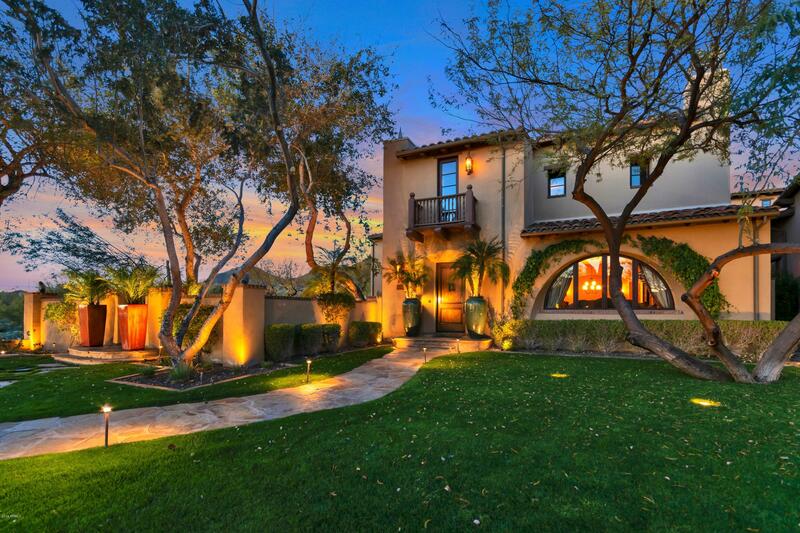 This master crafted Salcito home is a private retreat. Great room living with open kitchen, high-end appliances, hand-crafted details, stone finishes, and designer doorways create elegance and emit sophistication. An exceptional floor plan boasts a romantic master suite, 2 en-suite bedrooms, an office, and separate casita. Wonderful outdoor"
"Rare DEAL in Silverleaf! This custom residence was built for entertainment, and comfortable living. Designed by internationally renowned AIA Architect Bing Hu, and the only villa in lower Horseshoe Canyon Villas on a double size lot! Stunning finishes and features throughout include abundant natural light, soaring ceilings, wide open spaces, a well appointed chef's kitchen with custom mill work, dreamy hardwood beams and a Viking appliance package. Generous sized bedrooms are all ensuite. 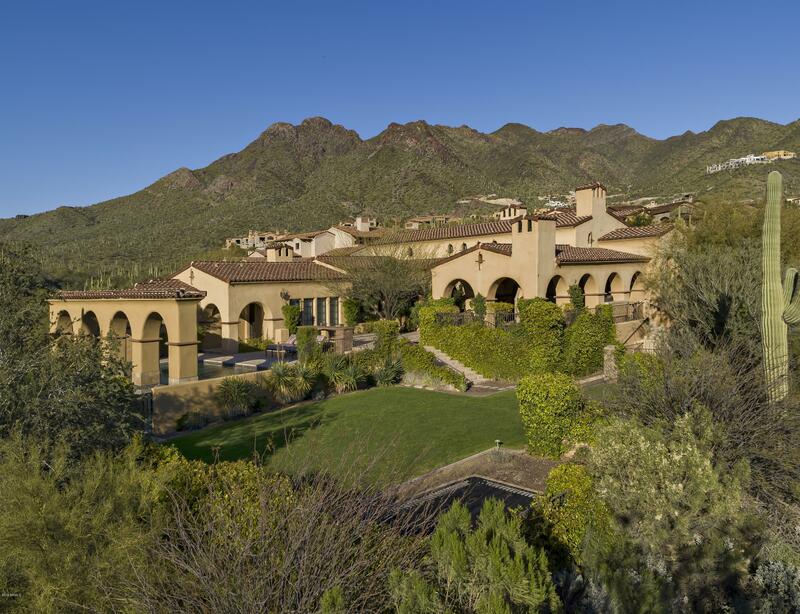 Outdoo"
"Sophisticated Silverleaf Canyon Villa offers seamless indoor/outdoor Arizona living at its finest. 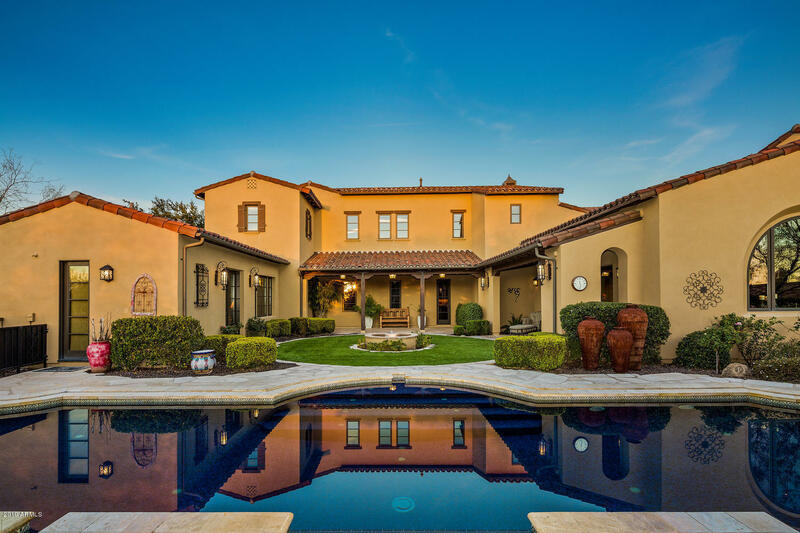 Impressionable entry courtyard with spacious travertine sitting area, gas firepit and water feature creates a warm welcome. Desirable split-level home plan gives you all the space you need where you want it. Downstairs find an expansive great room, kitchen, den with wet bar and generous master retreat opening to luxurious back yard, the upstairs opens to a loft/den with wet bar and opera balcony"